Front sports seats specially designed by Toyota Boshoku, for best-in-class body holding and support. 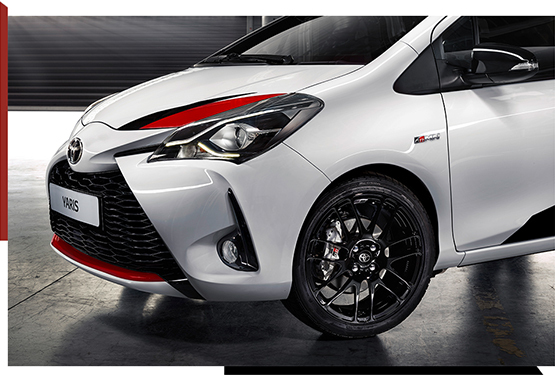 If you want to learn more about the unique Yaris GRMN, register your interest today. TOYOTA GAZOO Racing Stay up to date with all Toyota's motorsport news at the home of TOYOTA GAZOO Racing. Yaris There’s a contagious spirit about the new Yaris. Its bold colour range, energetic lines and stylish features don’t just ensure a stress-free and comfortable driving experience, its natural flair can turn an ordinary trip into a journey packed with energy and vigour. Toyota at Paris Motor Show 2018 As the automotive industry enters a once-in-a-century transformation, Toyota has started a shift from being a pure car company towards becoming an overall mobility company – offering ever better mobility for all New Toyota Yaris GRMN Inspired by Toyota's return to the 2017 FIA World Rally Championship, the new limited-edition Yaris GRMN is a full-blooded hot hatch tuned and tested on the Nürburgring’s Nordschleife. Toyota excites at Geneva Motor Show 2017 From a first glimpse of the radical urban i-TRIL Concept to revelling in the latest TOYOTA GAZOO Racing machinery – the Geneva International Motor Show is the place every Toyota fan should be. New 2017 Toyota Yaris The New Toyota Yaris brings a shot of adrenaline to everyday driving. Energetic lines and stylish features don’t just ensure a stress-free and comfortable drive, they provide style to give you a boost after every journey.